which is a purpose built tank that houses the Dirtbag and allows a much easier, safer and more controlled environment for collecting solids through the water transfer process. For this application the Dirtbags are cube shaped and measure 1m3 giving an even bigger filtration surface area than the stand alone Dirtbag. An outer tank with 1 No. 6" inlet and 2 No. 6" outlets with one blanking cap. The two outlets are situated at different heights to suit different applications and can both be used if pumping at high speeds. The tank measures only 1800L x 1200W X 1200H meaning it is smaller than a 1500 gallon settlement tank and takes up less room on your site. A removable baffle plate which can be inserted to create a settlement area and catch any additional smaller silt particles if required, or removed to create an instant water flow to the outlets. The image below shows the Dirtbag being used inside the custom built Dirtbox. 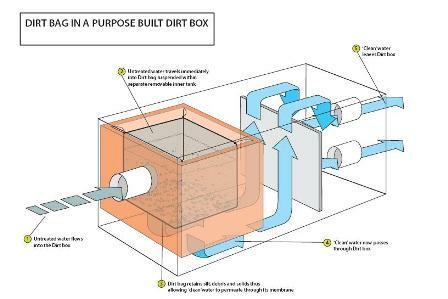 The Dirtbox will handle flow rates up to 280m3 per hour (1000 gallons per minute) which basically equates to a 6" pump working at full capacity. Once the Dirtbag is full and not accepting water at the desired flow rate then simply lift out the inner tank, remove the Dirtbag and dispose as per site waste guidelines, insert a new Dirtbag and carry on pumping. No manual lifting required as the inner tank and the Dirtbag have lifting eyes for mechanical lifting.